Last week a bunch of Europpos were hooning across central Europe for the Alpine edition of the 2018 Europpomeet. I will be doing a multi-part write-up of the events and stuff we came across during the meet. Today part 2! When I left you last time, we had just conquered the bad weather at the Nürburgring, and had found some cultural activities to fill out time. However to keep a good balance between car stuff, driving and culture, we decided to do some more touristy stuff on the third day. 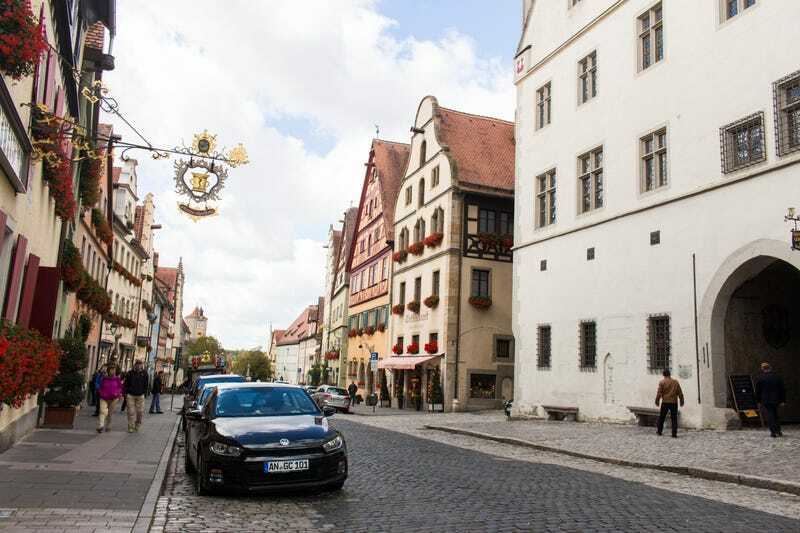 To start of the day we drove to the medieval town of Rothenburg ob der Tauber, which is part of the Romantic Route in Germany. Obviously we took the back roads, as there is way more fun to be had there (as long as the traffic plays along that is). The city centre of Rothenburg is still fully surrounded by a defensive wall, which is even largely accessible to the public. During our time there we decided to walk along part of the wall, check out the old city square, and take the trademark picture of one of the city gates. Of course we couldn’t leave Rothenburg without enjoying some proper German cuisine like Bratwurst, Leberkäse (and some more stuff I forgot). The defensive wall seen from the inside, also Renault 4! Probalby the most photographed part of Rothenburg. Our original plan was to drive back roads all the way to duurtlang’s place near Munich, where we would be staying during the Oktoberfest. However, having spend some more time than expected in Rothenburg, and wanting to arrive on time at the Oktoberfest we decided to take the Autobahn and blast to Munich at slightly higher speeds. gmporschenut and I settled into a steady pace of 140-160 km/h, whereas duurtlang, schaefft and Out, but with a W probably drove there a bit quicker. We did manage to beat Out, but with a W thought due to a detour he took, but we were all there at roughly the same time. Having converted duurtlang’s living room in some sort of a highschool sleepover location (but instead for drunk adult males), and having donned our Lederhosen (well all of us except our only real German schaefft), it was time to venture into Munich by train. From this point it was just a case of following the people in Lederhosen and Dirndl to get to the Theresienwiese. Once we arrived there, I was blown away by the size of it. Sure, I knew the tents were big, but I didn’t know that there were that many of them, nor did I know that there was a complete amusement park on site (because beer and roller coasters are the best combination, or something like that). After having gone through multiple tents to find a place (we should have been there earlier on the day), we finally got lucky with half a table that was free. Finally, we could sit down, drink beer and have some fun! It was amazing, but it also felt sort of familiar to me, as it seems like a lot of European countries have similar festivities that involve beer, music and dressing up weirdly. I definitely had a blast, until we were notified that we had to be out by 23:00 sharp. What we didn’t know is that security will remove you from the tent if you haven’t left by then. Navigating through the (even more) drunk crowds we found our way back to the train, which took us back to duurtlang’s place for some well earned sleep. The tents are absolutely massive! This one is even larger! To sober up a bit we decided to go to the BMW museum in Munich the next morning. Sadly the museum was undergoing a small renovation, but it was still very cool to see all the cars and bikes in there. I can definitely recommend going there! BMW Welt, as seen from the museum entrance, the E30 in this shot had driven there all the way from South Africa. Besides looking at the old cars, we also spent quite some time walking around the BMW Welt to try some of the new cars and bikes. Having enjoyed all kinds of BMWs, it was time to say our goodbyes to duurtlang and his Turbo 205 CTi, but also time to welcome Rustholes-Are-Weight-Reduction (maybe Rawr would be a good abbreviation) and his Peugeot 505 V6 into our group. With this slightly changed group we would start our back road dash into Austria. And while the roads were starting to get better and better, Rawr and I also managed to get stuck behind some other cars repeatedly. Two of those cars were even new-ish Porsches, but they were definitely not driving fast enough for the old French boat and the French hatch. This CR-V was the worst though, as he kept driving slow, and didn’t make enough room for us to pass. He even moved left when I was next to him... Anyhow, we continued on deeper Austria, with a restaurant at the Pillersee as our destination. And miraculously the Twingo arrived there first, as Rawr had apparently missed a turn, and the others were further behind than we thought. While driving there I did probably get a speeding ticket though, as I saw the speed camera’s flash. Ah well, luckily Austria’s fines aren’t too bad. The Twingo was the first to arrive!